Great place. Very helpful hosts. Beautifully appointed. Mix of old Japanese architecture with ultra modern plumbing. Great location. The hosts helped me figure out a way to get my luggage shipped to Kyoto. And then once there, they helped us to arrange for a shuttle van to Osaka airport. The walk around the immediate neighborhood to orient us was also very helpful. Would clearly choose to stay hete again! Machiya Lily is a beautiful place to stay. Our family really enjoyed our stay in this home. The location was great and quiet. Mark & Tomoko did a wonderful job with this Machiya. There is so much detail in the design. I wish we had more time to relax and enjoy the tranquil garden and water feature. After spending each day touring Kyoto, it was a perfect place to return to for a great nights sleep. We hope to return in the future. The only place to stay in Kyoto! Stunning renovation which combined a Japanese sensibility with western taste. I could go on and on but it lives up to all the reviews I read before booking. One small detail I loved is that the hand held shower had an option to put it at western shower height. Mark was a great host and was readily available to answer questions and make recommendations. I will definitely stay here when I return to Kyoto. We really enjoyed staying in this house. It is a great combination of traditional Japanese architecture and modern convenience, making for a very comfortable place to stay (there is also a nice collection of books on traditional Japanese architecture, from which I learnt a lot!). The location is good, with a number of cafes, restaurants and convenience stores nearby. It is within walking distance to Gion and the Kyoto Station and the subway station is just around the corner, allowing easy access to everything. The hosts were super-responsive and nice. We look forward to being able to return to the house. My husband and I loved our two weeks at the Machiya Lily. It was the perfect home base for our stay in Kyoto. 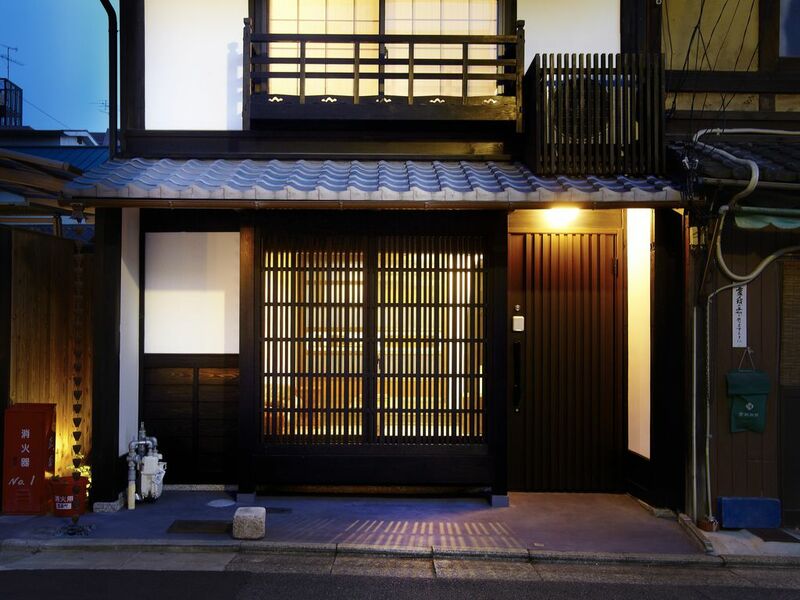 Mark did a sensitive job of updating the old kimono shop machiya bringing it into modern practicality while maintaining aesthetics and tradition. Mark and Tomoko were amazing hosts. Tomoko met us and walked us around the neighborhood, which is close to transit, restaurants and stores. Mark and Tomoko are the most generous and responsive hosts. The machiya is beautifully appointed; comfortable bed, great kitchen, and a superlative bath and shower. We became acquainted with the grocer on our street who had great fish, fruit and vegetables.The 8-seat sushi restaurant across the street was excellent, and very convenient. We could not have asked for a more ideal place to stay for our memorable first visit to Kyoto. This has been the best house we have stayed so far. Mark has thought about everything to provide the best comfort and even decorated the house and had a cake ready for my daughter's birthday! Communication is excellent with Mark and he provides suggestions on where to eat and how to get to places. Excellent place and host! We will definately come back to stay here again. Rates are subject to change until I have confirmed your reservation.